Normans appear to be a stronger version of the common Viking Infantry with improved shields, more health and throwing axes. They usually appear in groups of 3 or 5, occasionally as single units or in groups of 8. 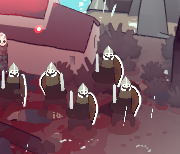 A stronger version of the Viking Infantry. One-time use ranged attack (Throwing Axes). Are vulnerable to archers when throwing their axes.